We bring our programs to you! Our educators will bring all necessary supplies and teach right in your classroom. Available programs, descriptions, and examples of covered K-8 standards are listed below. We bring the beach to you! Our educators will bring beach biofacts such as shells, bones, and skulls to teach your kids about the organisms we have on the coast of North Carolina. Learn about the organisms, touch the biofacts and have a fun day at the "beach!" K.L.1 Compare characteristics of animals that make them alike and different from other animals and non-living things. Learn about drones in science during this new 2-day program! On day one, students will discover what drones are, what drones are used for in environmental science, and learn the basics of programming a drone through an indoor mock drone flight. On day two, students will put their programming skills to test by programming a drone to complete an environmental mission outside your school! 8.E.1. Understand the hydrosphere and the impact of humans on local systems and the effects of the hydrosphere on humans. Students have the opportunity to learn processes in the water cycle. Discover evaporation, condensation, and run-off through hands-on experiments, and learn how water is naturally filtered and why soil is so important in this process. 2.P.2. Understand properties of solids and liquids and the changes they undergo. 3.E.2.1. Compare Earth’s saltwater and freshwater features (including oceans, seas, rivers, lakes, ponds, streams, and glaciers). 5.P.2.1. Explain how the sun’s energy impacts the processes of the water cycle (including evaporation, transpiration, condensation, precipitation and runoff). 6.E.2.4. Conclude that the good health of humans requires: monitoring the lithosphere, maintaining soil quality and stewardship. 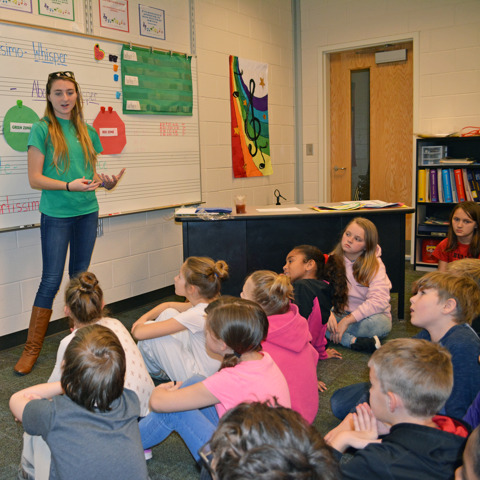 In this program, students will learn about the "work" that water can do! In a hands-on activity, students will see how different factors can influence the amount of electricity flowing water can generate. Caution: you may get wet! 6.P.3 Understand characteristics of energy transfer and interactions of matter and energy. Students learn how to use scientific instruments and discover these microscopic organisms that are vital to the marine food chain. 3.L.2.2. Explain how environmental conditions determine how well plants survive and grow. 4.L.1.1. Give examples of changes in an organism’s environment that are beneficial to it and some that are harmful. 5.L.2.3. Infer the effects that may result from the interconnected relationship of plants and animals to their ecosystem. 6.L.2.1. Summarize how energy derived from the sun is used by plants to produce sugars (photosynthesis) and is transferred within food chains and food webs (terrestrial and aquatic) from producers to consumers to decomposers. 8.L.3.3. Explain how the flow of energy within food webs is interconnected with the cycling of matter (including water, nitrogen, carbon dioxide and oxygen). Discover and discuss solar power as an energy resource. 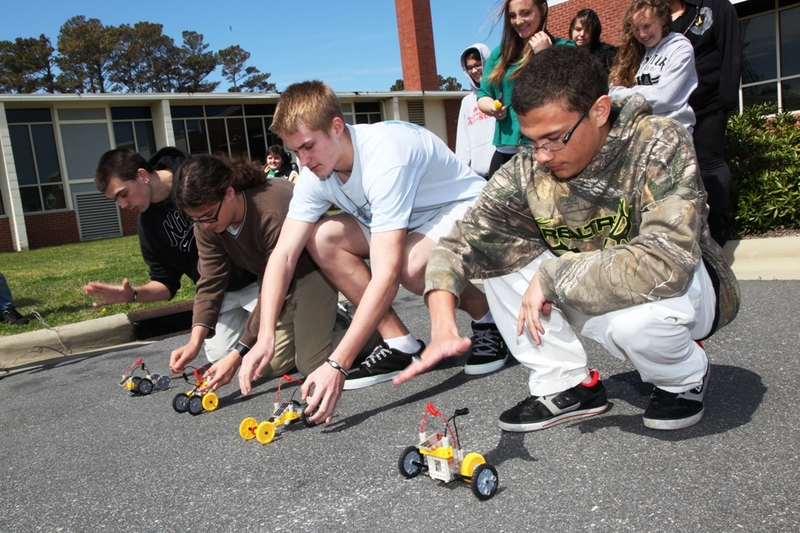 Students design, build, and evaluate a solar powered car and discover how solar panels maximize efficiency. 3.P.3. Recognize how energy can be transferred from one object to another. 4.P.3.1. Recognize the basic forms of energy (light, sound, heat, electrical, and magnetic) as the ability to cause motion or create change. 6.P.1.2. Explain the relationship among visible light, the electromagnetic spectrum, and sight. 7.P.2. Understand forms of energy, energy transfer and transformation and conservation in mechanical systems. 8.P.2.2. Explain the implications of the depletion of renewable and nonrenewable energy resources and the importance of conservation. Students will investigate the intricacies of structure and function of this unique organism. 2.L.1. Understand animal life cycles. 5.L.1. Understand how structures and systems of organisms perform functions necessary for life. 7.L.1. Understand the processes, structures and functions of living organisms that enable them to survive, reproduce and carry out the basic functions of life. 8.L.3. Understand how organisms interact with and respond to the biotic and abiotic components of their environment. 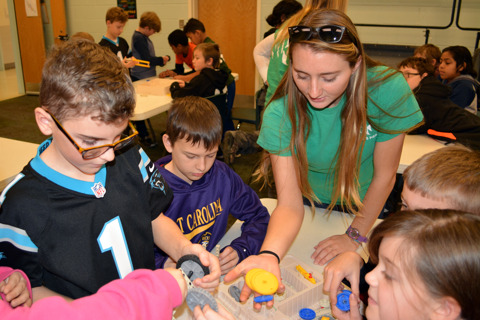 Students learn how to harness energy from the wind, advantages and disadvantages of wind energy, and ideal locations to install wind turbines to maximize energy output, through the construction of their own “turbine”. 5.P.1. Understand force, motion and the relationship between them. 6.P.3. Understand characteristics of energy transfer and interactions of matter and energy. Travel to the beach virtually! Our educators will show beach biofacts such as shells, bones, and skulls to teach your kids about the organisms we have on the coast of North Carolina. Discover and discuss solar power as an energy resource. Students design, build, and evaluate a solar powered boat and discover how solar panels maximize efficiency. Students will race their boats outside as a final test of their success. Students learn about scientific instruments and discover the microscopic organisms that are vital to the marine food chain. Students will be able to see on a screen what a scientist sees through a microscope. Small group outreach program (up to 30 students): $100 for initial program; $50 for each repeat of same program on same day. Add $100 for drone program. Large group outreach program (31 or more students): $200 for initial program; $100 for each repeat of same program on same day. Add $100 for drone program. Virtual learning program: $100 for program and activity trunk shipping. For festival or demonstration booths: $250 for first four hours $75 for each additional hour.